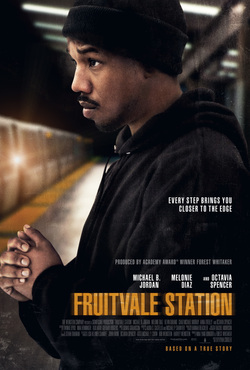 Fruitvale Station is a dramatic reconstruction of shocking events that occurred in the early hours of New Years Day 2009 in Bay Area, California. It tells the story of Oscar Grant (Michael B. Jordan), a 22 year old African American, fighting to find a way to support his family without having to resort to former criminal ways. Despite his efforts, unconditional love from his very close family and a solid group of loyal friends, Oscar struggles to put his past transgressions behind him, and an innocent night out celebrating with loved ones leaves him in the wrong place at the wrong time. In the immediate aftermath of a tragic incident Oscar’s story was thrust into the public eye after disturbing witness footage was broadcast around the world. Within four days it was downloaded over half a million times and led to protests and marches across the US. Oscars life and character was put under the spotlight, scrutinised, and became highly politicized. Director, Ryan Coogler, achieves his objective to re-humanise Oscar for the audience and portrays him as a much loved son, partner and doting father, with a heart wrenching poignancy.